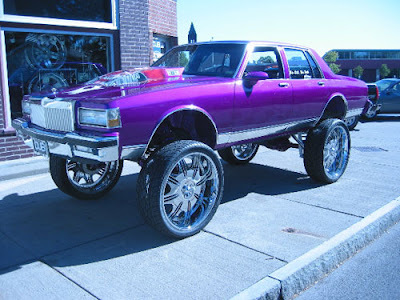 They are called “Hi-Risers” not High Risers or High Riders or Low Riders but “Hi-Risers” these are cars that are not 4x4’s but are jacked way up on very large rims with low profile tires. But don’t call them “rims”!!! At and above a 20” rim they are referred to as Dubs which is a term that came from 22 inch rims, get it? Dubs = double 2’s = 22’s. These cars are normally larger cars and in the Hi-Riser world, 4 doors are just fine if not preferred. So now you know the general term to describe these rides (aka “Whips”). We need to go deeper because not all Hi-Risers are created equal! There are 3 categories of Hi-Risers: Donks, Boxes and Bubbles! Am I going to fast? I will slow it down for you. And it wouldn’t be a bad idea to take some notes! Boxes: Mid-80s Impala, Caprice and Monte Carlo or any mid-80s ride with a boxey rear clip (a square car). This is an easy one to remember because it sounds like what it is. Also note that Boxes can be a Donk by keeping the front higher than the back. Bubbles: '90s Caprices and Impalas, '90s rides that are rounded on both ends. Once again it sounds like what it is, a rounded off car. 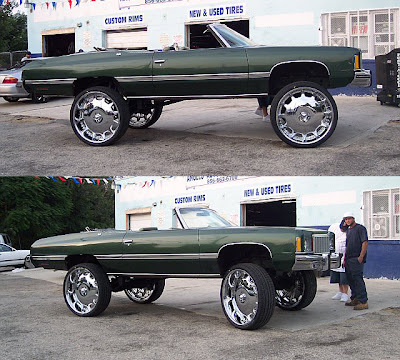 This can also be a Donk by following the rules of Donks! I personally would be very careful if you decide to mod your car into a Hi-Riser because most insurance companies will not insure a car with a modified suspension. Ok, as Family Pastor I have done my job & you have been educated. BTW, Jim, I am willing to help you Donk-out your mini-van on your next visit. Sir, there will be no "Donk"ing. I'm a baptist, and it sounds too much like fun. Wow..I think all of that "education" is frightening. 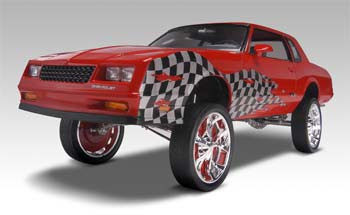 If you would like to "donk" I know a certain Monte Carlo that would look pretty spiffy done up. ...very informative. Thank you very much.